Gov. Ned Lamont has recast his proposal encouraging school districts to share services, eliminating some of the words — like “redistricting” and “consolidation” — that prompted widespread controversy and protest. Lamont said he understands the concerns of many constituents who object to forced consolidation and is hopeful the changes he made to his proposal address those concerns, according to a statement from his office. At a legislative hearing before the Planning and Development Committee where the bill came up as part of a broader discussion Wednesday, however, some residents and others expressed relief about the revisions while others said they still could not support the governor’s plan. The original bill mentioned “redistrict” or “redistricting” eight times and “consolidation” eight times. Lamont’s bill still contains some controversial sections, however, including one that requires small districts — defined as districts with fewer than 10,000 residents, fewer than 2,000 students or with only one or two schools — to share a superintendent with another district or name a chief executive officer to oversee the schools. If such a district chooses instead to maintain their own superintendent without sharing, Lamont’s proposal says, the commissioner of education may withhold funding in an amount equal to the superintendent’s salary. Lamont continued Wednesday to defend the need for shared services, however. 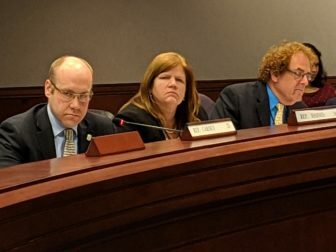 Rep. Devin Carney, R-Lyme, raises questions about the “end game” of the governor’s proposed Commission on Shared School Services. To his left is Rep. Irene Haines, R-East Haddam. He said the use of words “like redistricting, consolidation” were tied in many ways to “some other more draconian proposals out there.” Harris was referring to school regionalization bills proposed by Sen. President Pro Tem Martin Looney, D-New Haven, and another by Sen. Majority Leader Bob Duff, D-Norwalk, and Sen. Cathy Osten, D-Sprague. Because the bills proposed by Looney, Duff and Osten were not drafted by March 15, both bills are now dead. Rep. Devin Carney, R-Lyme, a member of the Planning and Development Committee, said he still opposes the governor’s bill because he’s unclear about what the “endgame” is for the Commission on Shared School Services. He said he expects there will be a “patchwork of different ways” that Connecticut can reach the goal of being more efficient and effective. Carney said he is also concerned that the commission Lamont is proposing includes only one parent. The revised bill does specify that the governor’s six appointments to the commission must come from one of each of the six Regional Education Service Center districts. Harris said he thinks there would be willingness to discuss who should serve on the commission.